Dennis Wong sells a lot of anti-reflective (AR) coating. “99.9 per cent of the lenses we sell have it,” says the Vancouver-based optician and owner of EyeCity Optical. Wong may be exaggerating but only slightly. Older patients who had bad experiences with AR in the past or those who balk at the cost are the only ones who leave his shop without it. Wong takes pride in the amount of AR he sells, and rightfully so: his numbers dwarf the national average, which, according to industry estimates, is slightly higher than 50 per cent. Even though this number is likely to increase as the use of free-form lenses (which must be treated with AR) continues to grow, Canadian opticians have a lot of work to do to catch up to their colleagues overseas. In Europe, according to industry reports, roughly 75 per cent of all spectacle lens pairs sold are treated with AR; in Japan, this number is a stunning 99 per cent. Given the obvious benefits of AR, both optical (reduced glare improves visual acuity and reduces eye fatigue) and cosmetic (the coating cuts down on glare reflecting off the front of the lenses), Canadian eyecare professionals should be pushing to increase the numbers of AR coated spectacle lenses they dispense, experts say. AR is a must for myopes, for example, as well as those opting for polycarbonate lenses (because of increased chromatic aberration). 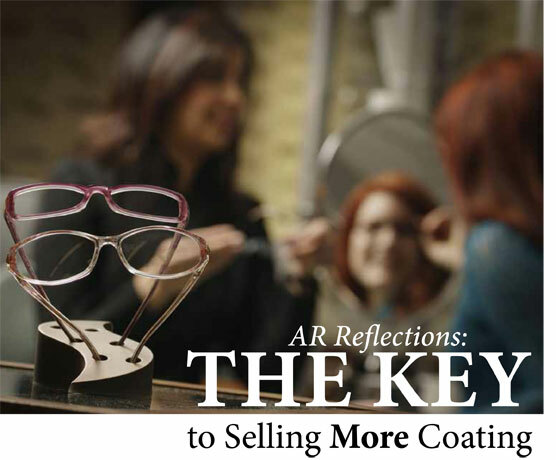 Thankfully, some recent changes in the coating marketplace should spur growth in AR sales. First, as Madelaine Petrin, RO, B.Sc., notes, the quality of AR coatings available in Canada has improved significantly in recent years, making the peeling and scratching issues associated with the product largely a thing of the past. Still, the professor of opticianry at Toronto’s Seneca College emphasizes that even with the improvements, opticians must caution patients when dispensing glasses to care for their AR coated lenses properly. “[AR coated lenses] still must be handled with care,” she says. “And not all coatings are equal.” She advises opticians to research coating products carefully and to avoid using them on certain lenses, such as some safety glasses (depending upon the conditions in which they will be used) and lenses for hyperopes (some say AR highlights wrinkles around their eyes), unless they are also fitted with aspheric lenses. Wong tried a number of coatings before working with a lab that imports its AR from Germany, where quality has traditionally not been an issue. Even so, fitting patients the right way is crucial in dispensing AR, he says. Another factor affecting AR sales that’s unlikely to change is that provincial health care plans do not currently cover the coating, meaning patients must pay for it out of pocket. This can mean an extra charge of $20 to $30, if not more. However, all is not lost: to mitigate this extra cost, Wong suggests offering AR as part of a “package” with other premium lens features. In the end, avoiding some of the barriers to AR sales and taking advantage of the opportunities comes down to educating patients. Wong believes strongly that education begins in the optometrist’s exam chair. If your optical shop is part of an optometry practice, encourage doctors to “prescribe” products such as AR coating by touting its optical and cosmetic benefits; if you’re an independent optical shop, partner with optometrists in your local area, if possible, and develop a patient education program.